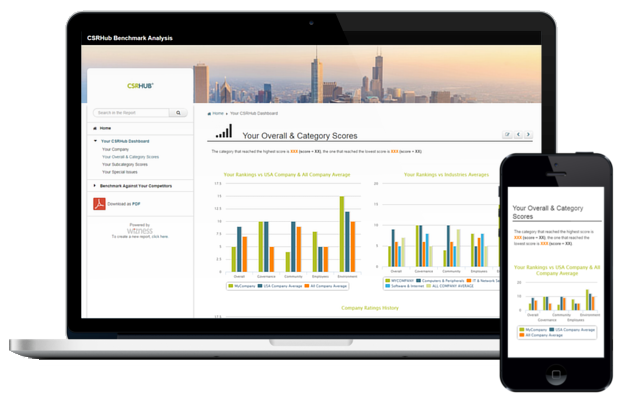 Compare your performance to your industry peers with the CSRHub Benchmark Template. Evaluate your Sustainability Performance thanks to the CSRHub ratings methodology, covering four main categories: Governance, Community, Employees & Environment. Evaluate the Sustainability strategy of your competitors, identify the leaders and laggards of your industry and compare your ratings to theirs. By comparing your own CSRHub ratings to the industry peers of your choice, the benchmark helps you identify the Sustainability areas in which you excel, or need improvement. This tool is for any corporation looking for a quick and efficient way to benchmark their environmental, social, governance and community performance against their industry peers. The Benchmark Template has been created in partnership with CSRHub, one of the leading sources of corporate social responsibility ratings and information. For more information about CSRHub Methodology, please click here. Are you a Consultant or an Enablon Solution User? We have special packages tailored to your needs! Contact us for more information! WANT TO KNOW HOW WELL YOU PERFORM IN YOUR INDUSTRY?